I’m going to make a maple bacon bourbon stout. I don’t need to explain myself. You know why. The problem is getting the bacon flavor in the beer. There has been discussion on various forums, and some breweries (Garret Oliver of Brooklyn Brewery) have even made commercial examples. The main options tend to be smoking your own malt with bacon, using bacon bits, etc etc blah blah I WANT TO USE REAL BACON. I’m going to put a slotted baking sheet over a regular flat baking sheet. I’m going to make some sort of awesome contraption of tin foil that will keep the bacon somewhat vertical. Like seats, for the bacon. I’ll take a picture when I get this going so that that makes sense. Then I’m going to bake the bacon at 400˚ (random choice of temperature) until it is super crispy. 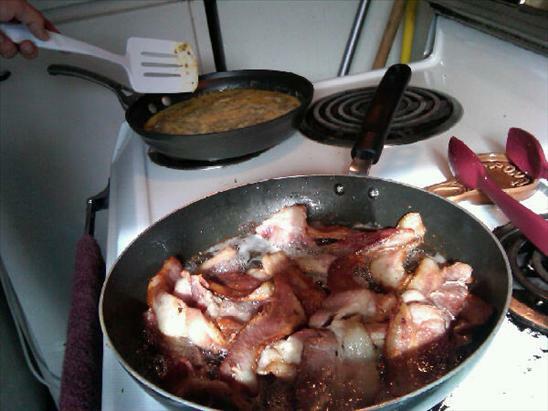 The hope is that this will cause the least amount of grease possible, while still making awesome bacon. For this first attempt, I’ll get normal bacon, not flavored with anything (like maple, pepper, whatever). I’ll also hope for thin bacon for this first attempt. Science! Once it is super crispy, but NOT BURNT, I’ll break it up into smaller pieces, and soak it in some bourbon. Not sure what kind yet. I’m open to suggestions. The amount of bourbon will be determined by my stout recipe, which I haven’t written yet. This vat, or at least jar of bourbon with bacon will sit in the fridge for a few weeks. I’m thinking I’ll do this tomorrow (Saturday, March 6th), and let it soak for 2-3 weeks. Hopefully any excess grease and fat will congeal and float to the top in the fridge. This will be skimmed away. When the soaking is done, I’ll pour the liquid through a coffee filter. Probably two coffee filters. Twice. No fat, no chunks. Then I’ll add this to the secondary fermentation. Too many cooks in the kitchen? Psh. Found this image at Ruthie Cherry Fine Art. Check them out, it's good stuff. Ok, I have a lot of ideas. How cool would it be if you could blink and be somewhere else in the world? See? Ideas. Anyway, I have some ideas based in reality as well. After some pretty intense discussions with my roommate Jim this weekend, I have an idea that I’m going to do right now. Do you have any idea how awesome it is to have good friends who push back on your ideas? Over good beer? It’s a great thing to have in life. I’m going to make beer. Starting in December, at least one Sunday a month, I’m going to do Breakfast and Brewing. Fancy title, I know. Here’s the plan. Come over around 11am on a Sunday. We (we being the collective housemates of.. our house) will make breakfast. Bacon, eggs, coffee. There may or may not be awesome cartoon watching – narf! – and there may or may not be bloody mary components available. Then around noon or 1, we’ll make beer. No matter your level of brewing experience, you can help. I, or someone else with some brewing knowledge will explain things in as little or much detail as you want. If you help, you get to take some beer home with you (a month later). There are many more details, but that’s the gist of it. What do you think? Want to come over and help me make some beer? If you want to be alerted to these awesome Breakfast and Brew days, or to new posts in general, sign up for the mailing list.